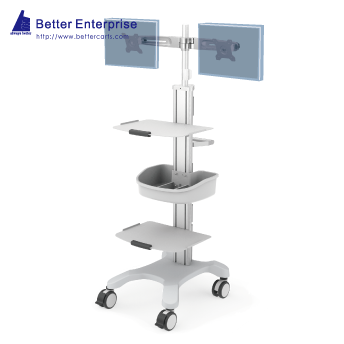 Better Enterprise Mobile Equipment Cart with LCD Monitor Mount, 3 Shelves and Utility Basket is designed specifically to accommodate the various choices of medical equipments with easy mobility and effortless maneuverability and let you configure the equipment cart to best meet your exact requirements. 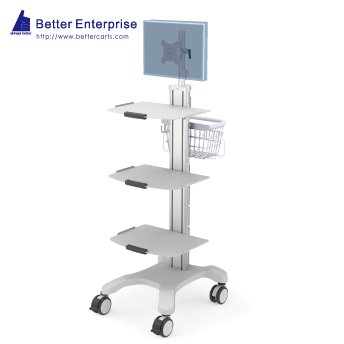 Mobile Equipment Cart with LCD Monitor and 2 Shelves supports one display with a weight up to 17.6 lbs. 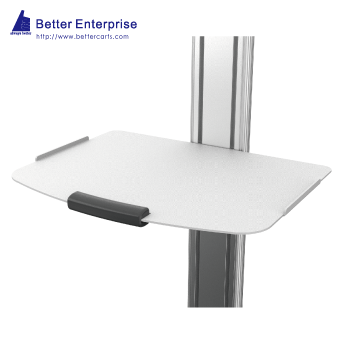 (8kg) and fits the monitor with either VESA mounting pattern of 75 x 75 mm or 100 x 100 mm. 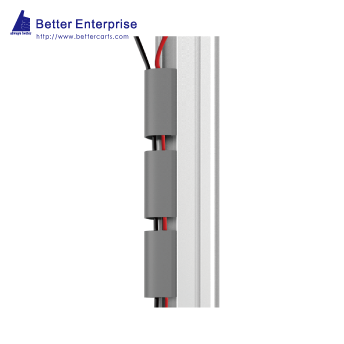 It’s also easy for you to position your monitors at proper height. 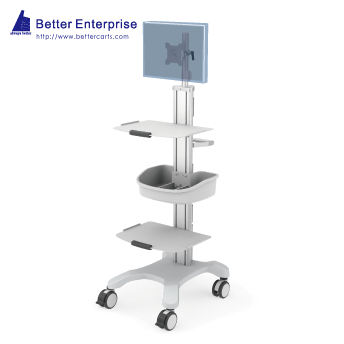 The monitor size is optional according to your application environment. 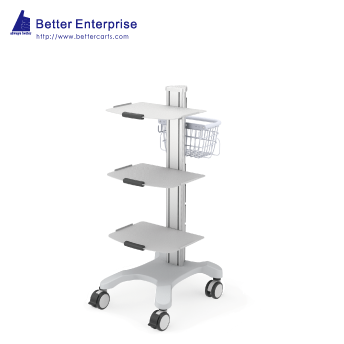 The shelves of the Mobile Equipment Cart with LCD Monitor Mount, 3 Shelves and Utility Basket feature raised lips to prevent your equipment from falling off while moving room to room and the rounded corners of the shelf protect users from injuries. 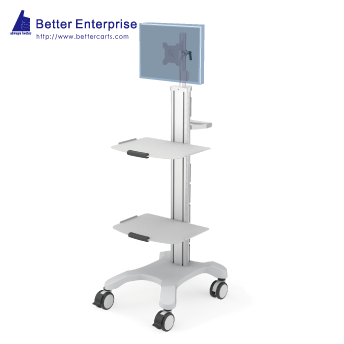 The height between shelves is adjustable according to the dimension of the medical equipment. 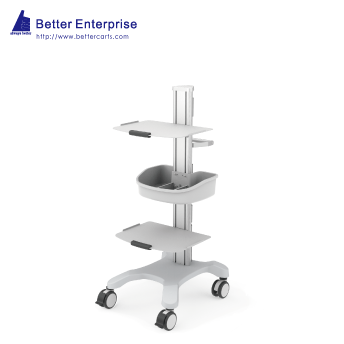 The sturdy 4-Prongs aluminum die casting base for Mobile Equipment Cart with LCD Monitor Mount, 3 Shelves and Utility Basket creates easier and more stable mobility with elegant outlook which overpowers other brands who are still offering furniture base or chair base. 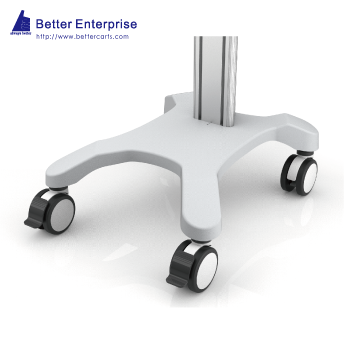 The optional counter weight gives better performance with much heavier devices. 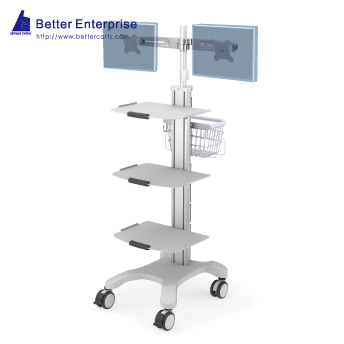 Better Enterprise is Mobile Equipment Cart with LCD Monitor Mount, 3 Shelves and Utility Basket manufacturer, Mobile Equipment Cart with LCD Monitor Mount, 3 Shelves and Utility Basket supplier, and supplying professional Mobile Equipment Cart with LCD Monitor Mount, 3 Shelves and Utility Basket products. 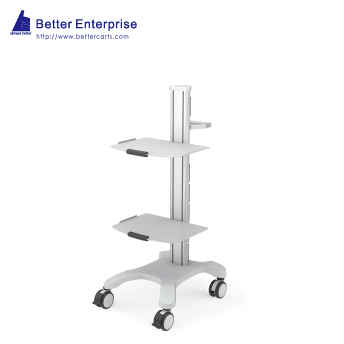 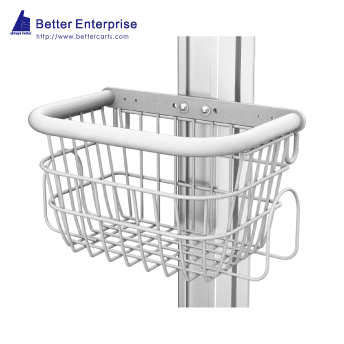 With Better Enterprise′s wide range of production methods, experience and OEM capability, Better Enterprise will be your first choice for Mobile Equipment Cart with LCD Monitor Mount, 3 Shelves and Utility Basket. 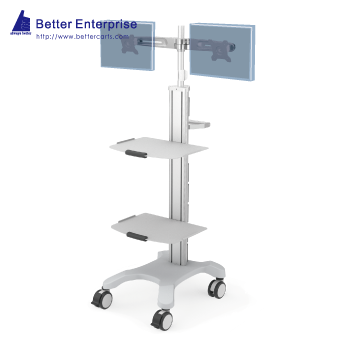 Choose Better, Always Better.We Products: Medical Instrument Stand, Mobile Computer Cart, Mobile Equipment Cart, Medical Roll Stand, ECG Cart EKG Cart, Ventilator Cart, Ultrasound Cart, IV Stand, Classic Cart, MRI Conpatible Cart, Infusion Pump Stand, Wall Mount, Desk Mount, Stools, LCD Monitor Cart, Accessories.